This post will tell the way to extend system partition with professional partition software when it reports low disk space alert message. Download IM-Magic Partition Resizer Server to fix the problem on system partition low disk space in Windows Server. System partition gets full? Windows says low disk space warning message? Don't panic! You can resize the system partition with a third-party partition program. IM-Magic Partition Resizer Server provides easy way to increase the size of system partition when it is running out of disk space on Windows Server 2003, 2008, 2012 and other Windows operating system. This partition program enables you to reallocated hard disk space without repartitioning the hard disk. Yon can extend system partition with keeping disk data and operating system untouched. How to Extend System Partition Step by Step? Move the arrows to shrink the selected partition to create some unallocated space. You need to move the unallocated space close to system partition. Then, right click system partition and select "Resize/Move" option. Move the arrows to extend the system partition and choose "Apply" button. "My PC is running more and more slowly recently since there is no free space on system partition. When I boot my PC, Windows says that you are running on low disk space on C drive. It requires me to delete some unnecessary files to free space, but I didn't save much data to this partition. There are many folders in system partition, but I don't know what they are. So I don't dare to delete them. I am afraid if it will affect the performance of my PC or cause system crash after deleting. 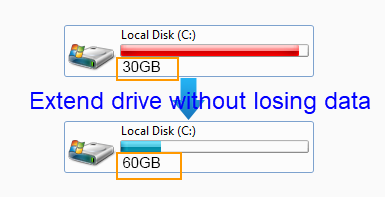 How can fix the low disk space on system partition on my PC with Windows Server?" Windows will report low disk space alert when system partition is nearly full. You cannot ignore the warning message if you don’t want to run into any trouble due to low disk space on system partition. The, what can you do? * You can expand a NTFS data volume by running Diskpart under Windows Server 2003, 2008, 2012. * You can resize hard disk under Disk Management under Windows 2008, 2012, Windows Server 208 R2, Windows 2012 R2, Windows 7 and Windows 8. If you are unable to resize hard disk with Windows build-in tool, a third-party partition tool enables you to resize hard disk without any limitation. As far as I know, many PC users will reinstall system and repartition the hard disk when they are running out of disk space on system partition. Undoubtedly, you can fix the low disk space problem on system partition after reinstalling and repartitioning hard disk. However, it is time-saving and it may cause data loss due to system reinstalling and repartitioning. If you can use IM-Magic Partition Resizer Server, you are able to extend system partition on Windows Server without reinstalling or repartitioning. It provides safe way to resize system partition when it is running out of disk space on Windows Server 2003 2008 2012 and keep data untouched. 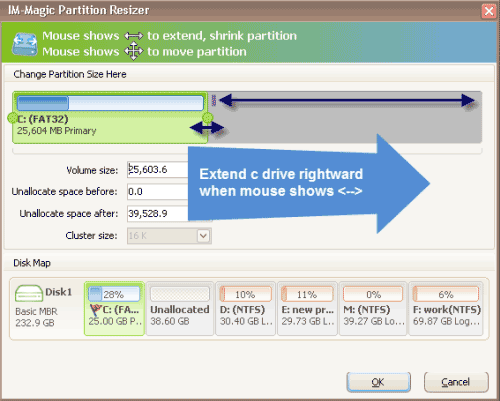 IM-Magic Partition Resizer Server also supports RAID 5 partition resizing. When system partition runs on low disk space on RAID 5, you can move free space from other partitions on the RAID 5. If there is no other partition or there is no free space on other partition, you can also add a new hard disk, which will display behind RAID 5 and shows as unallocated volume. You can add the unallocated space to expand system partition space. With the partition software, you can extend RAID 5 system partition without rebuilding the array.